Click on the Channels button. Ensure that your Channel is selected from the list, and we’ll now add your Playlist to the Channel. 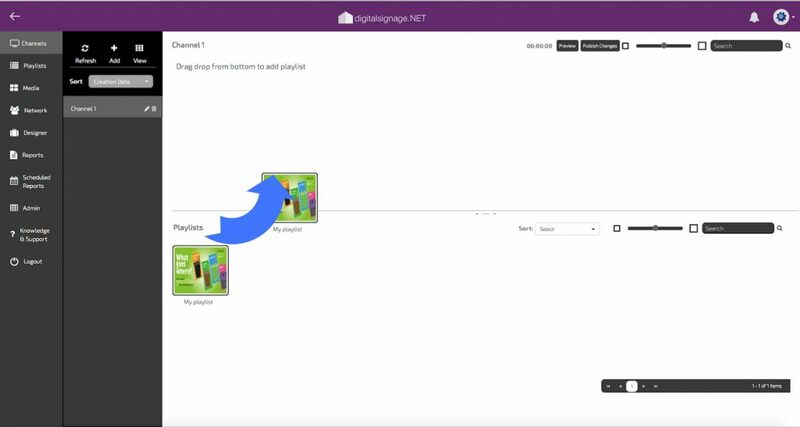 Simply click on the playlist you’d like to add and drag it up into the playlist area. A Channel can have more than one Playlist assigned to it and again you can use CTRL and Shift to select multiple items if required. When you release the mouse button the playlist will be dropped into the Channel and the ‘Publish Changes’ button will flash. Nothing is sent to the players until you press the Publish Changes button. The button flashes to remind you.